Beijing is a mixture of both modern delights and traditional legacies of China. As a 3,000-year-old city, it retains so many historical places to visit such as the world-famous Great Wall, the grand imperial palaces and gardens. Here are the top 10 places to visit in Beijing to give a fast reference for your tour. There is no doubt that the Great Wall of China should be the first must-see place in Beijing, especially the Badaling Great Wall, which is the most complete and essential section. Badaling is divided into south part and north part. The best location to enjoy a panorama of the great ancient fortifications is at the 8th watch tower in the north section, which is also the highest one among the 43 watch towers. Since it’s so popular among tourists, it may be crowded on holidays. 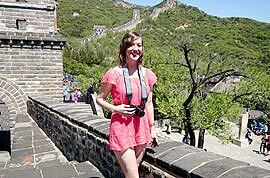 Then Mutianyu Great Wall is also a good option. Tiananmen Square, as the city center and one of the Beijing famous places, has witnessed many historical events. Tourists can see many important buildings around the large square including the Tiananmen Tower, the Monument to the People's Heroes, the Great Hall of the People, the Memorial Hall of Chairman Mao, and the National Museum of China. Forbidden City, also called the Palace Museum, is surely one of the top 10 places to visit in Beijing. It is the most complete and largest wooden structure complex in the world. Serving as the royal palace of the Ming and Qing Dynasties (1368 - 1911), it contains numerous exquisite antiquities and cultural relics. The Treasure Gallery and Clock and Watch Gallery are the most popular galleries. The Summer Palace used to be a royal garden and resort for imperial families. Today, it is one of the best places to visit in Beijing, and there you can see the spectacular palaces of emperors of the Qing Dynasty (1644 - 1911). Besides appreciating the living and working places of the emperor, taking a boat tour on the Kunming Lake can be very enjoyable. As the largest princely mansion in China, Prince Gong's Mansion contains more than 30 ancient buildings with an exquisite design and reasonable layout. It was the private residence of Heshen, a powerful minister in the Qing Dynasty. The mansion had witnessed the history process of the Qing Dynasty from the heyday to the decay. The Western-Style Gate, the Grand Theater House and a “Fu” Stele stolen by Heshen from the imperial palace are the three things you cannot miss. As one the must-see places in a Beijing tour, the Temple of Heaven used to be a holy place for the emperors in the Ming and Qing Dynasties to hold the Heaven Worship Ceremony. Some exquisite ancient palaces for the heaven worship are still well-preserved. Today, the park around the temple becomes a popular gathering venue where visitors can see a lot of local people doing morning exercise. After visiting various historical buildings, another must-visit place is the Wangfujing Street, which is a time-honored commercial district in downtown Beijing. There are a lot of shopping malls with both world-famous brands and old Beijing brands. Besides shopping, tasting delicious snacks is essential. Here lies one of the most popular snack streets in Beijing. Location: It is a north-south street to the east of the Forbidden City, with the south entry on East Chang’an Avenue and the north entry on Wusi Street. The Zoo will surely be one of the top places to visit in Beijing and it is one of the largest city zoos in China with the most variety of animals. It consists of three zones, East, South and North, including African chimpanzees, Australian kangaroos, leopards, and Mexican manatees. Of course, you cannot miss the cute giant pandas! In addition, there is an aquarium in the North Zone, which is strongly recommended. Yonghe Temple is the largest Tibetan Buddhist temple in Beijing. As one of the top places to visit in Beijing, the temple combines the characteristics of both Han Buddhism and Tibetan Buddhism and houses various Buddhist statues, Tangkas and many precious cultural relics. What’s more, in Wanfuge Palace, you can see an enormous statue of Maitreya made of sandalwood with 18 meters’ (60 ft) height and 8 meter (26 ft) is buried underground. Sanlitun has become a fashion landmark and it is definitely one of the most interesting places in Beijing. Many local people and expats choose to enjoy their night life in Sanlitun Bar Street and you can find numerous bars with different styles. Having fun with friends in a nice bar can be really an interesting experience. Besides the bars, there are a lot of fashionable brands and shops. The Taikoo Li Shopping Mall is the most popular choice for fashion seekers. How to reach from Wanfujing Road Galaxy Soho Beijing 2012 by Metro ? Is the Galaxy Soho located at No.7A, Xiaopaifang Hutong, Dongcheng District? And you want to know the transportation from Wangfujing to there?